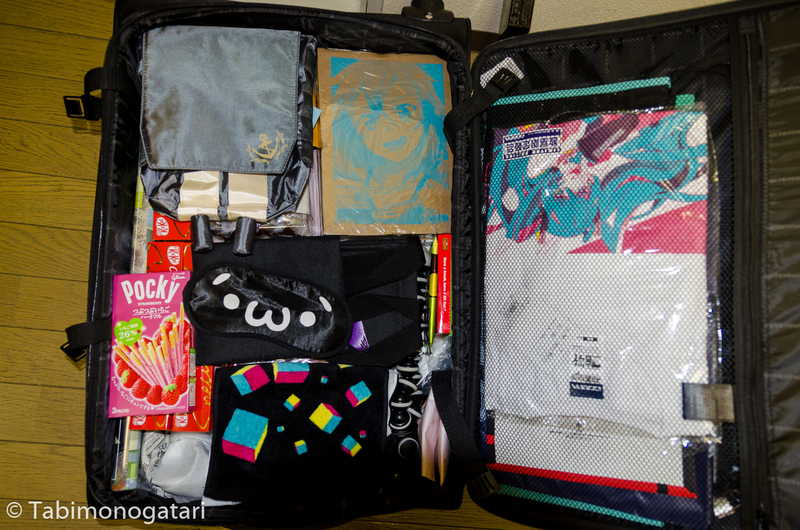 While I already returned to Switzerland safely, I have a bit of a backlog about my last days in Tokyo. Read this article as a two-day guide (three days with the last one) to Tokyo for those with little time. Please do not be overwhelmed by the 3200 words in this article. I highlighted the names of the places I visited, to make it a bit easier to follow. Please understand, there are endless things to see in Tokyo. Also, try to orientate on this map to not loose entirely track. 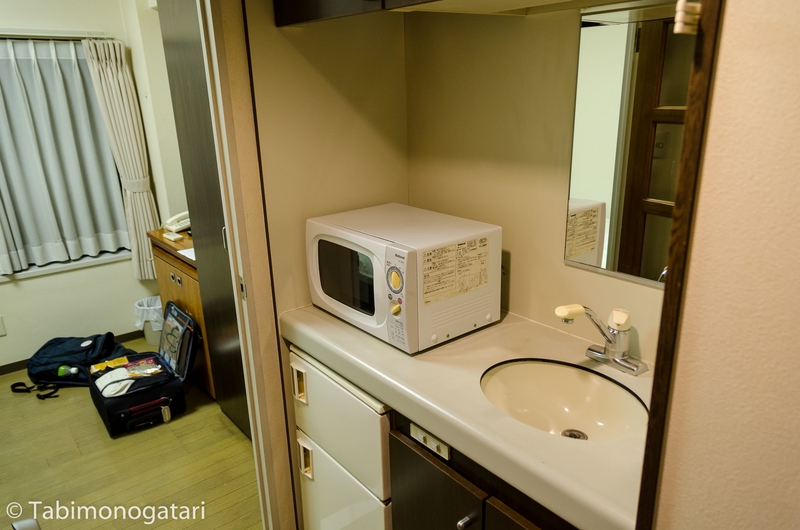 But before that, I wanted to go into detail about my accommodation. Staying for four nights I was looking for a furnished apartment, instead of a hotel. After asking around and researching I found out about the Flexstay Inn chain. 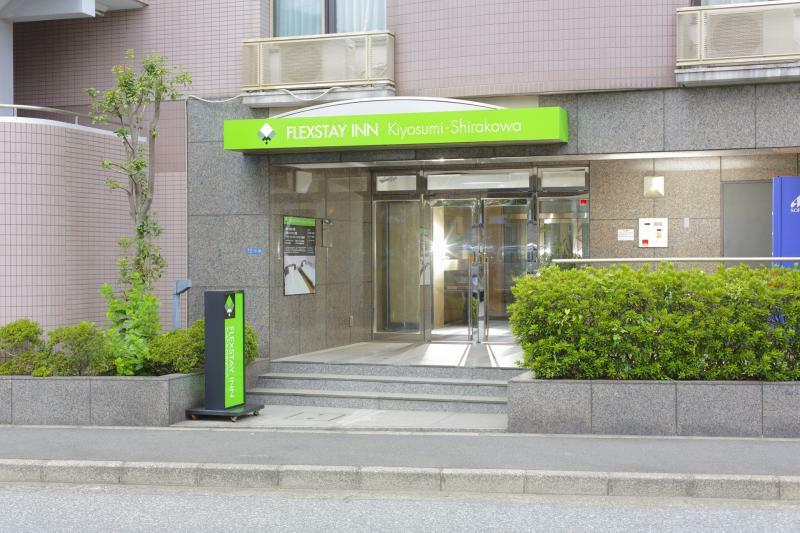 Looking for a compromise of location, price and availability I chose the Kiyosumi Shirakawa apartment complex. The apartment was far from luxurious, but suited my needs. The rent was not that much for a furnished room with kitchen and bathroom, a television and air con (totally necessary in the summer). The rooms are locked by key cards and are not cleaned throughout your stay. Coin laundry machines are provided to do your laundry. 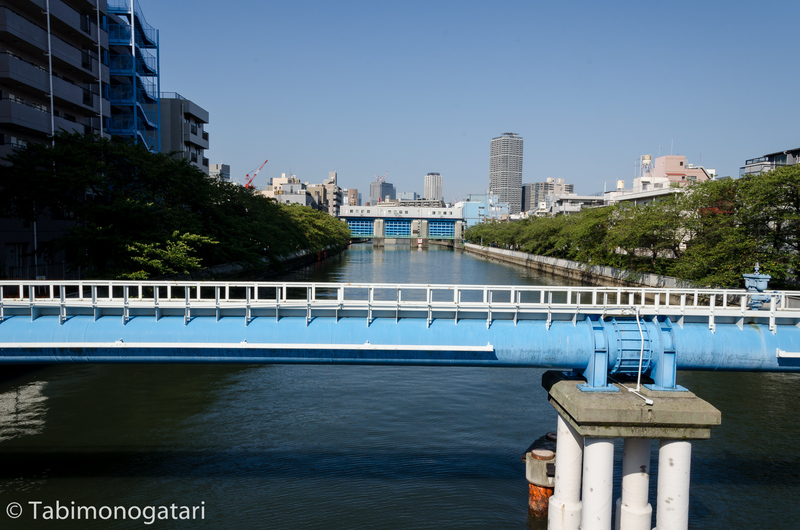 On first thought the location beyond the Sumida River is far off the center of the city. It is not very central, but it is well connected to the subway network. 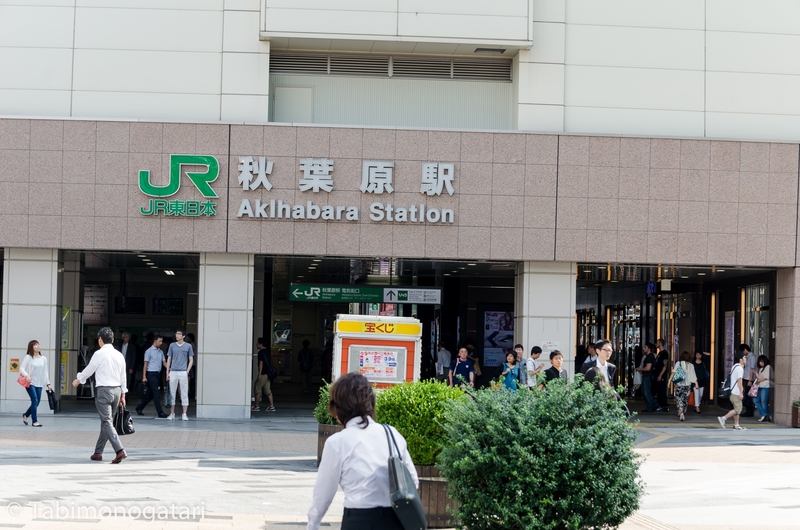 Using the two subway lines five minutes away by walk Tokyo station and the Skytree are just five minutes away and places like Tsukiji, Shibuya and Shinjuku are reachable without transferring. 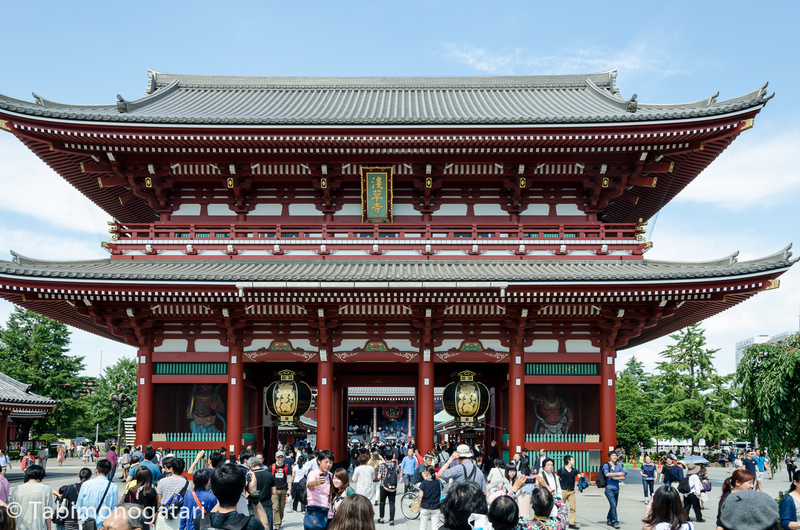 Let’s talk about the various spots to visit in Tokyo. Plan at least three days for the city, or better four. Alternatively, do not attempt to do everything on this list, otherwise it will get too cramped. 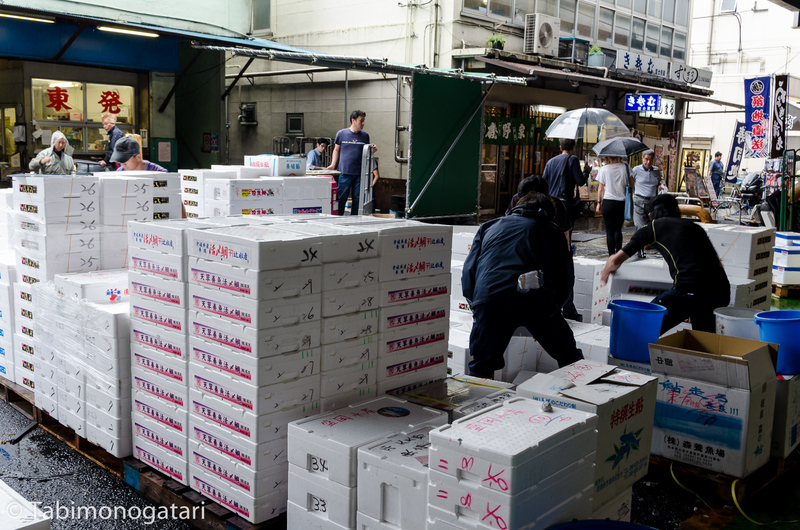 One of the things everyone suggests is visiting the Tsukiji fish wholesale market, nothing for late risers. Dozens of travel guides recommend showing up with the earliest train at five and watching the merchants selling and cutting the freshly caught fish. Don’t. You will only stand in the way. Thanks to its rising popularity the market is nowadays crowded with tourists without awareness about the etiquettes of the market. While it seems obvious, once on site most seem to forget that visitors may not disturb the merchants or enter certain areas. To remind everyone these amusing comics illustrated the most important rules. Last time I did it the “suggested” way, taking the first train and walking around, when I noticed that it is much better for both your sleep rhythm and the everyone’s mood if you show up in the late morning, say about 9 a.m. and go to one of the restaurants on site. There you can have the freshly-caught fish as sashimi with rice for breakfast. 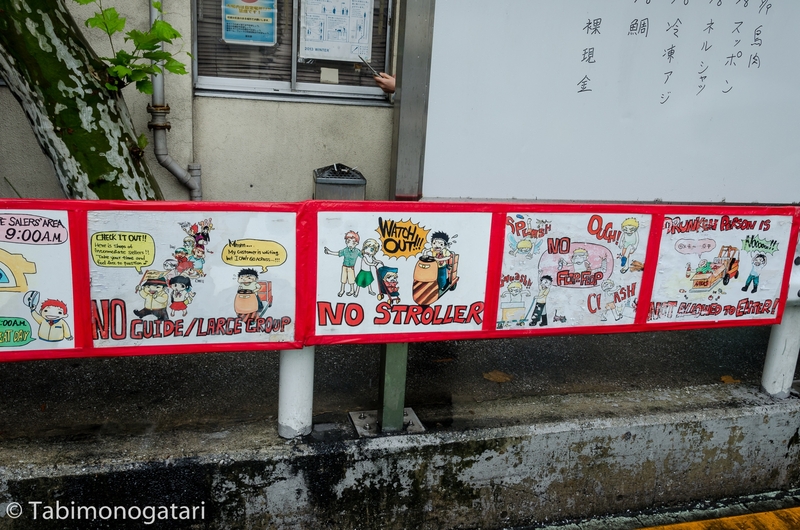 After you calmed your stomach you can walk around the area more freely, because the selling is done at that time. There is still much to see and you do not stand in the way that much. That morning was not blessed with sunshine. At least I brought an umbrella with me which still could not prevent my shoes becoming soaked, it really rained a lot. With the subway I reached Tsukiji soon and made my way to the food stalls. In one of them I ordered Anago-don (Rice bowl with eel sashimi accompanied by green tea and a miso soup). It was a funny experience, since I was acting as a interpreter for a short while, trying to make the newly arrived guests close the sliding door since they forgot and did not get the clue in Japanese. Afterwards, I headed to Ginza, walking through the heavy rain. 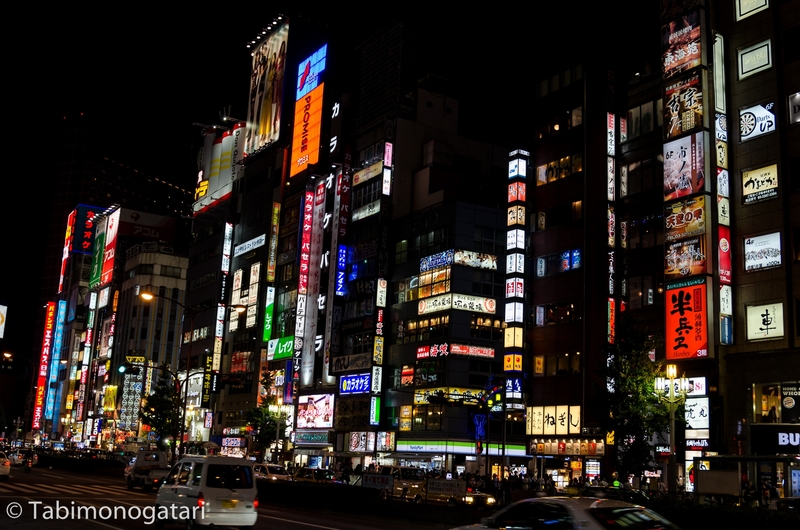 Ginza is a place comparable to the Champs-Élysées in Paris or the Bahnhofstrasse in Zurich, where you find dozens of boutiques and clothing stores. Even if you are not interested in shopping clothes, take the time to enjoy the Sony Showroom. 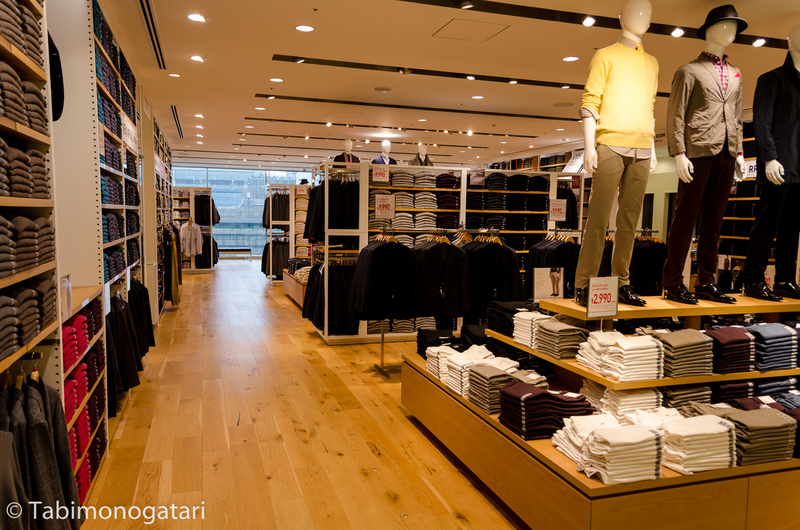 Uniqlo is a well-established brand of cheap to middle-range priced clothes. The flagship store in Ginza houses ten floors with much to choose from, for men and women alike. The next stop around noon was Shibuya. 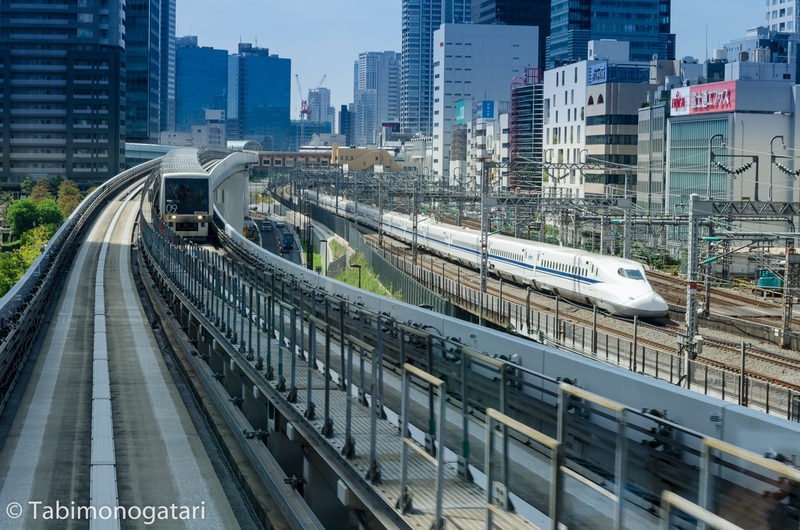 The district in the West of central Tokyo is well connected by means of trains and subway. 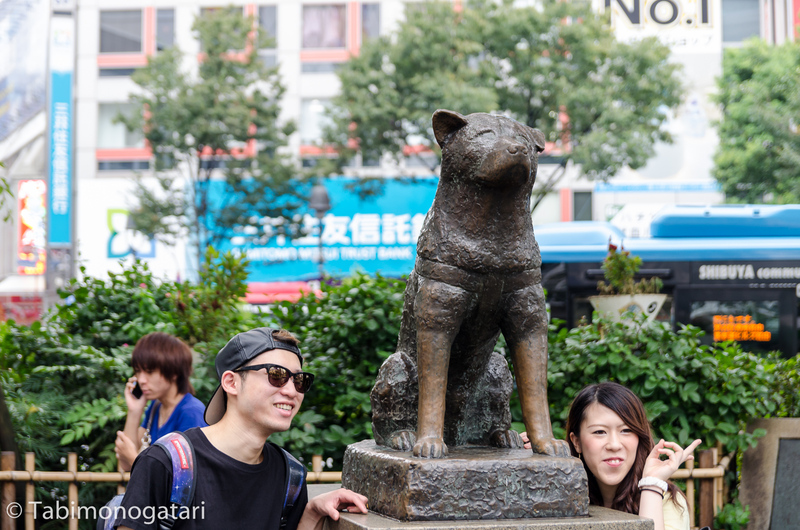 Once you head out of the (right) exit you will notice the statue of the dog Hachiko. If you do not know its story, please catch up on it. It is a heartwarming story that left a deep impression in the society. It is also the perfect meeting place and a popular photo spot. 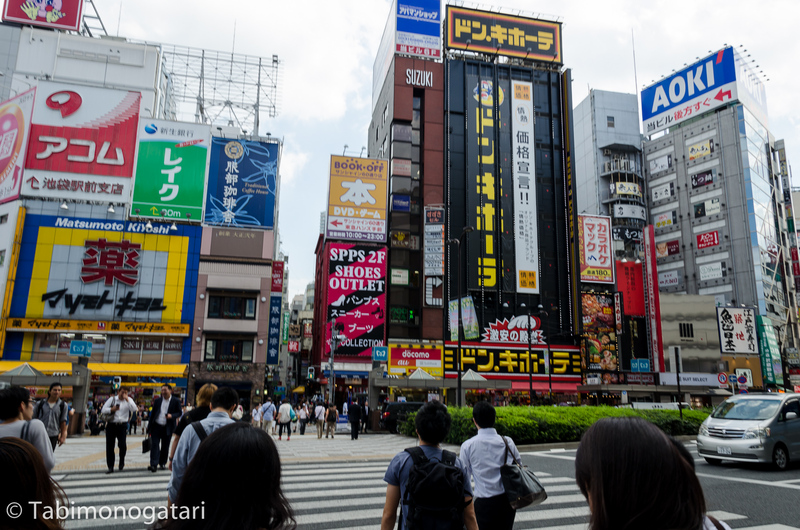 Just a few metres further away is the world-famous Shibuya crossing. 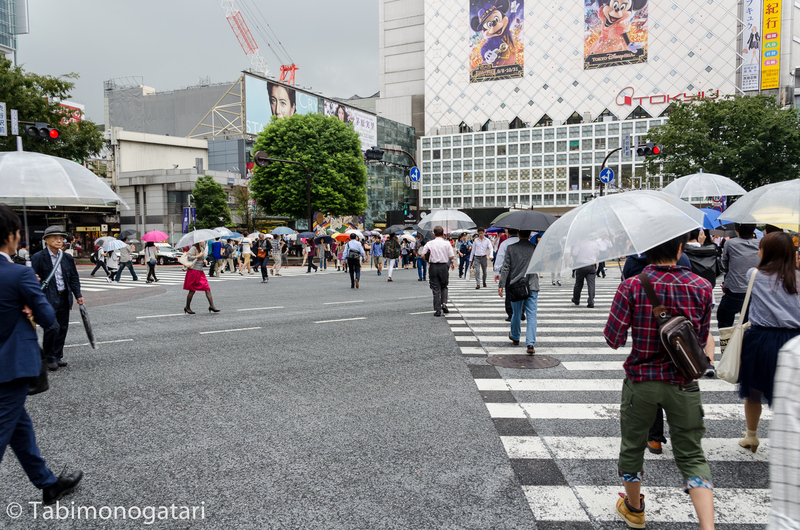 In Japan many major crossings are designed to be crossed diagonally, too. When all traffic lights turn red for the cars a huge crowd begins to move every few minutes. The spectacle can be watched from the Starbucks branch on the second floor on the opposite side of the street. In Shibuya there was a particularly high foreigner density that day. 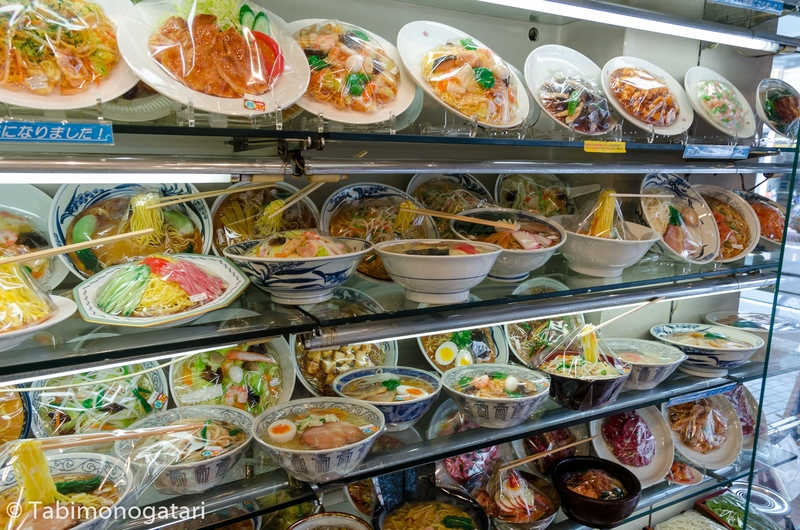 Many international shops and restaurants can be found around Golden Gai and Spainzaka and the dishes offered are more likely Western than Japanese. Taking the Yamanote line to the other side of the city I arrived in Akihabara half an hour later. 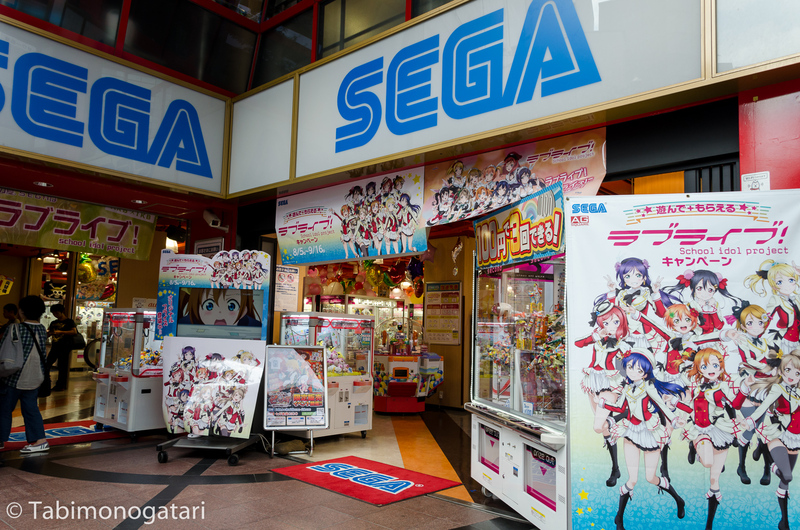 The place is famous for its huge amount of anime, games and electronics stores. 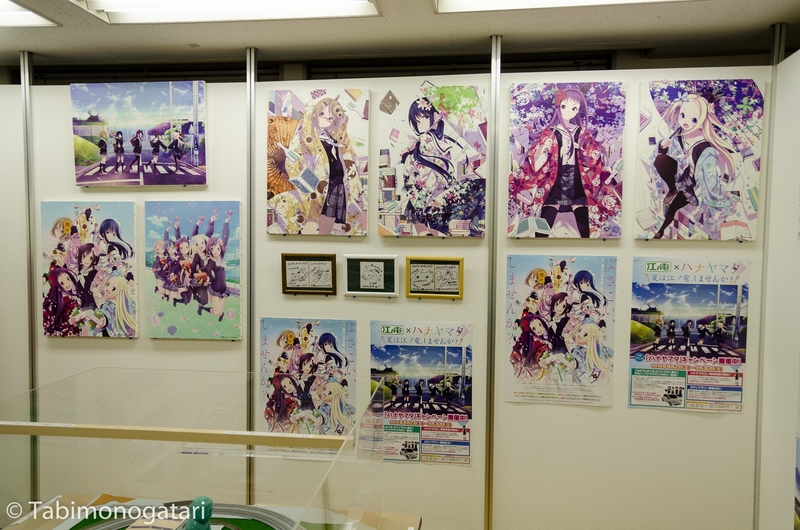 Upon leaving the station anime characters are displayed at all kind of places. At every corner stands a girl in a French maid outfit inviting to visit her maid cafe, another typical Japanese thing. 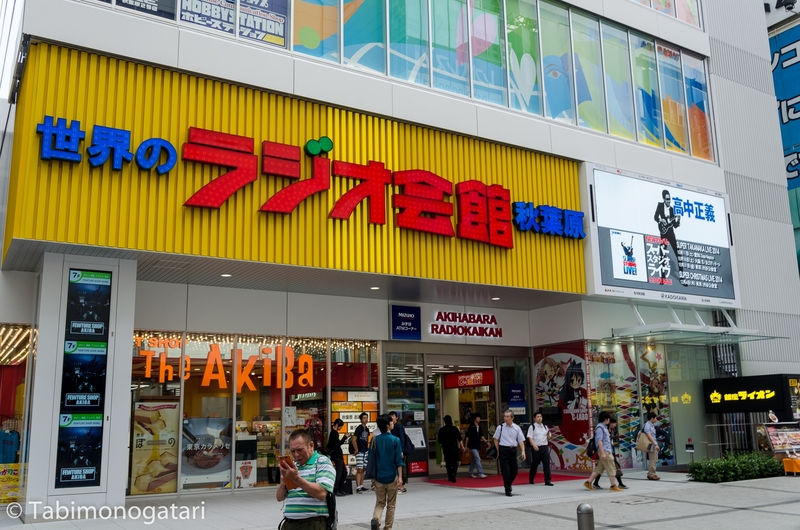 I will probably write a more detailed article about Akiba sooner or later. Edit: Here it is. 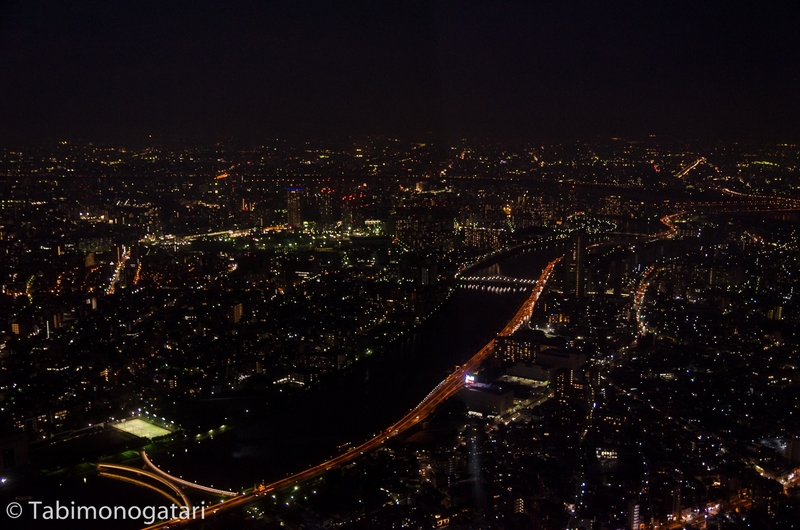 As the sun set I left for Tokyo’s highest building with the best view you can have over the city, the Tokyo Sky Tree. The 634 metre high tower offers two 360-degree observatory platforms at 350 and 450 metres. Even being so high up you can not make out the outskirts of the city, it stretches until the horizon in every direction. Arrive shortly before sunset and enjoy the sun setting over Shinjuku and stay until it gets dark. Tickets can be reserved in advance by credit card. While it is not necessary I recommend doing so on weekends. The long day exhausted me a lot so I went home after. 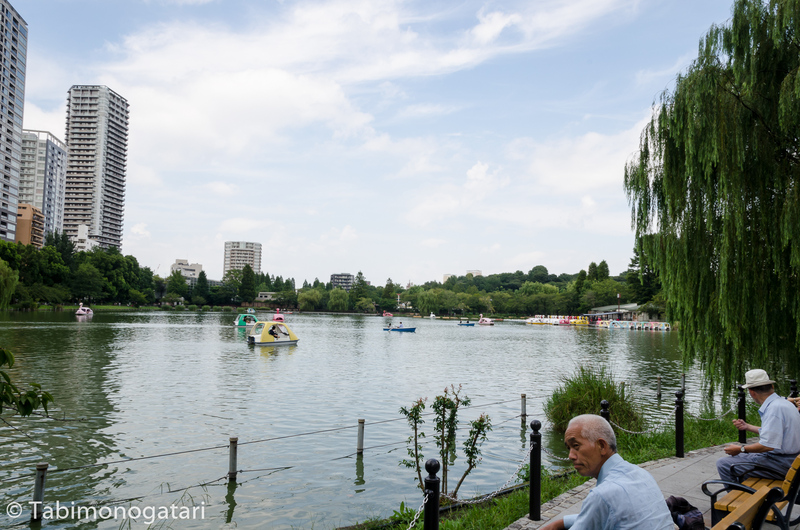 The next day I was on the way to the Shinjuku Park, one of the biggest green spaces in Tokyo. 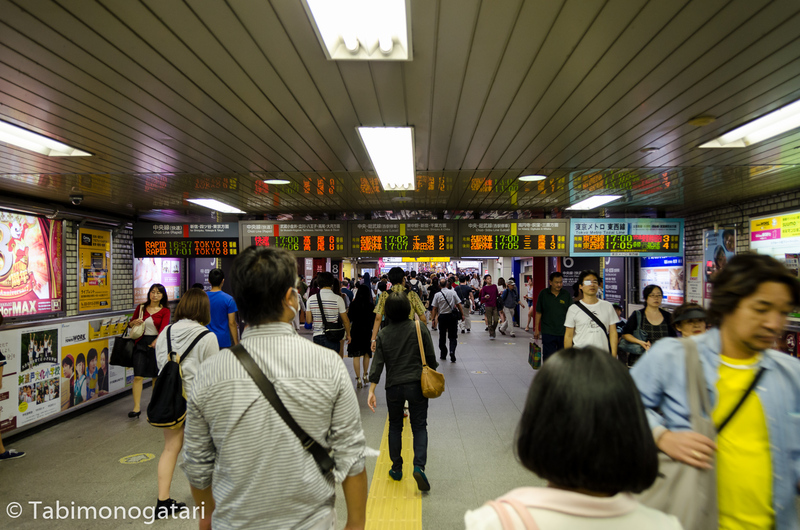 On the way, I transferred at Shinjuku station, the most-frequented train station of the world. 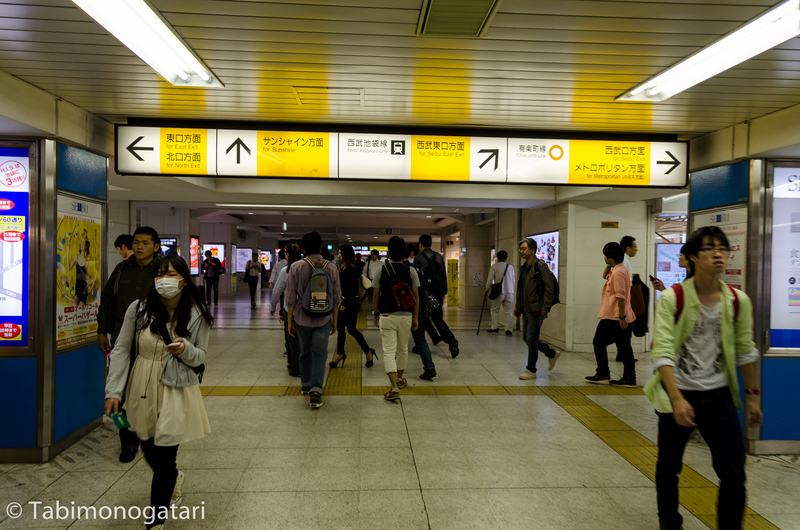 Countless train lines meet at different floors with miles of underground passageways inbetween. Make sure not to get lost. 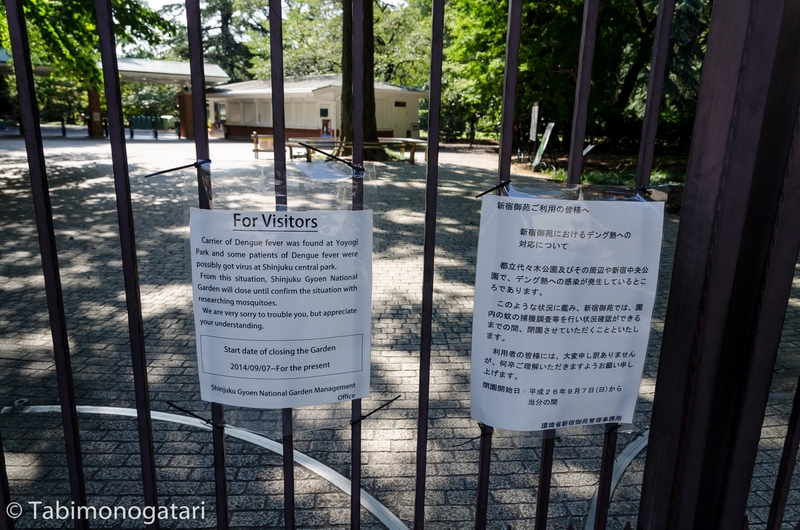 Like I told you before, the Yoyogi Park was closed because mosquitos carrying the Dengue virus were found in the park. Still, I kept my hopes high that the Shinjuku park would not be affected. Taking precautions the park was also closed for a while. If you happen to come by, please visit at least one of the two parks. After a quick breakfast at Yoshinoya’s, the place for cheap Gyudon, I took the Yamanote line in the direction of Shinagawa. You never have to wait for a train long, since one departs approximately every two minutes. At Shinbashi station I transferred to the Yurikamome line, bound for Odaiba. The line does not drive on rails and is fully automated. Try to get a spot at the front to see other passing trains, the harbour and the Rainbow Bridge on the way. The artificial island is full of amusement places and strange sites. Places like Joypolis or Oedo-Onsen-Monogatari offer all kind of fun, I did not try out either this time. 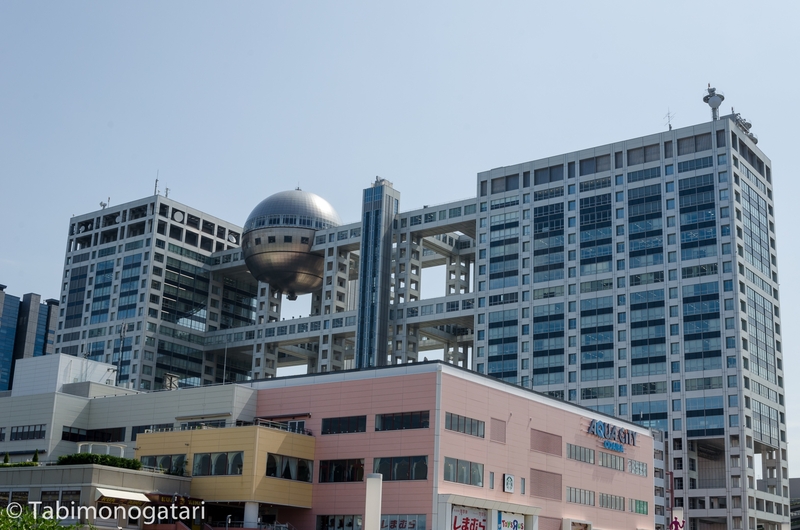 Odaiba features many unique buildings and structures, like the Fuji TV building or the Rainbow Bridge. 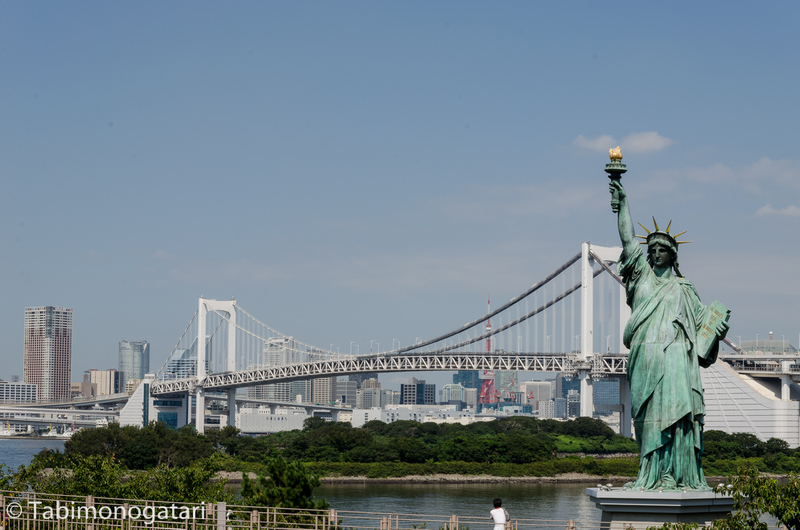 And no, I do still not know why they erected a statue of liberty there. Also observe the Eiffel Tokyo Tower in the back. 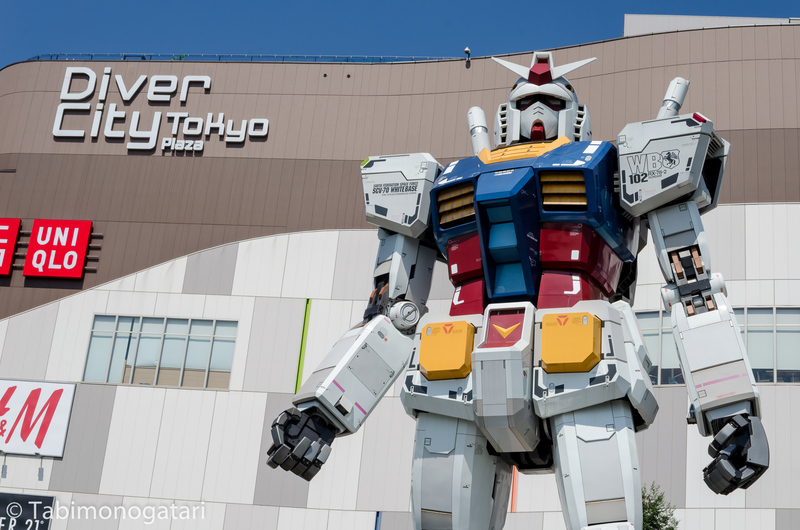 Behind Diver City is a 1:1 scale statue of a Gundam, a humanoid robot from the popular anime series. 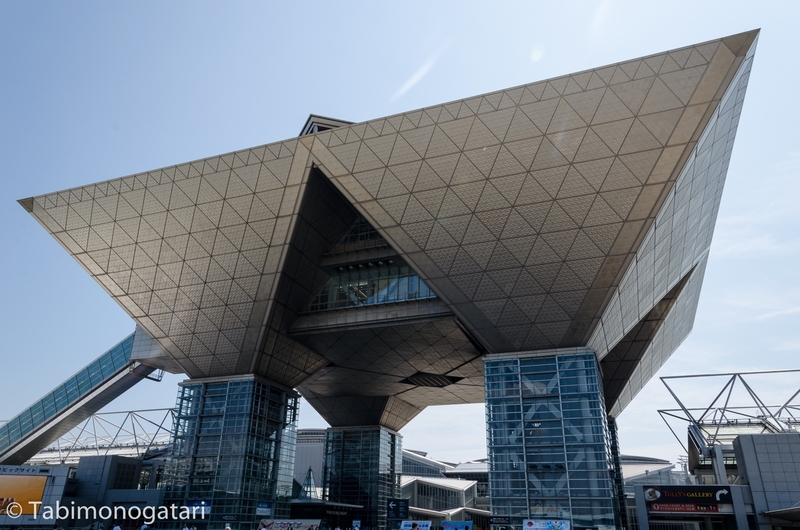 On the other side of the island is Tokyo Big Sight, a convention center used for many big scale conventions and exhibitions, like the Comiket. 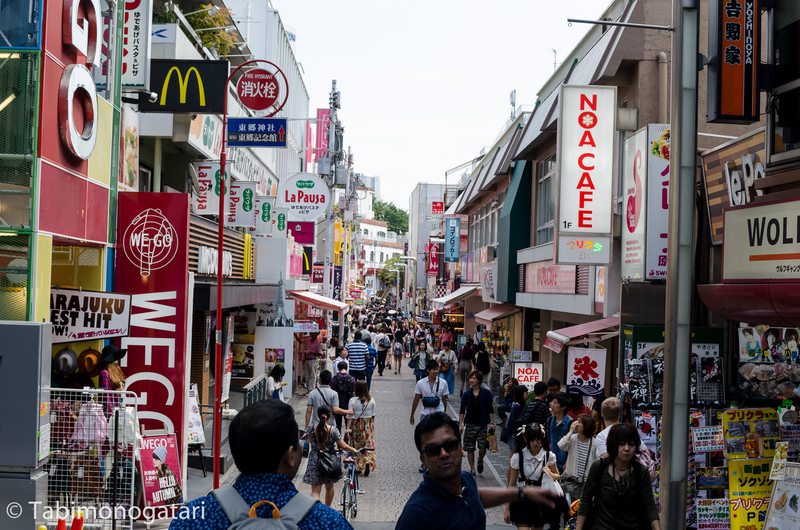 Moving on, the next place I visited was Harajuku. 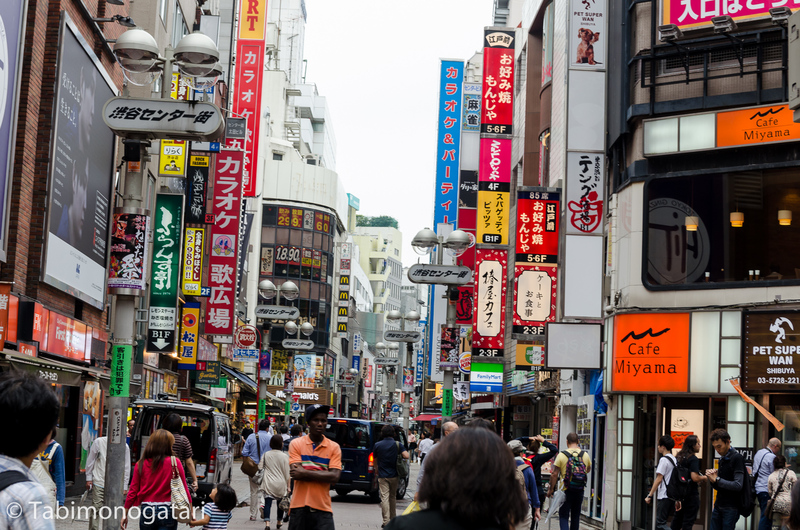 Close to Shibuya, this area is the center of youth fashion and lifestyle. 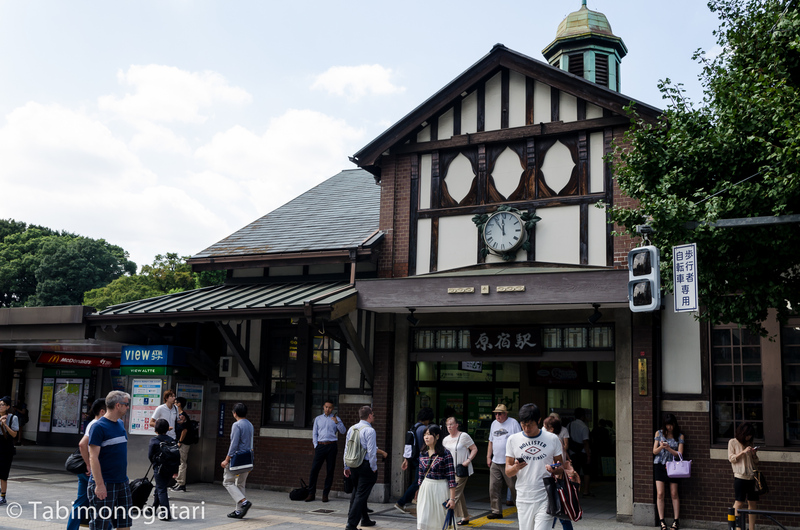 Yoyogi Park, one of the biggest green spots in Tokyo is just one minute away from the station. The Meiji Shrine is also in this park. 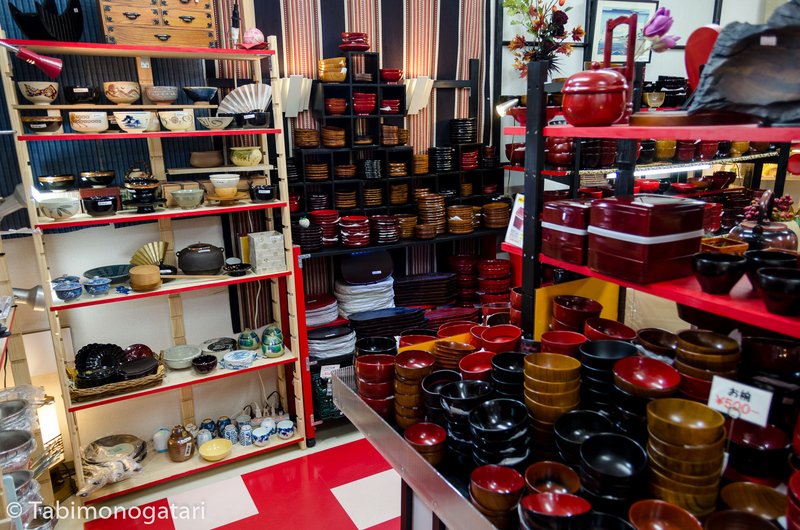 Takeshita Dori, just one minute from the station, is another must visit. Dozens of small shops sell clothes and other accessories. Pick up a crepe from one of the stands if you feel hungry. Avoid standing still to long as the streets are narrow and the crowd is always moving. 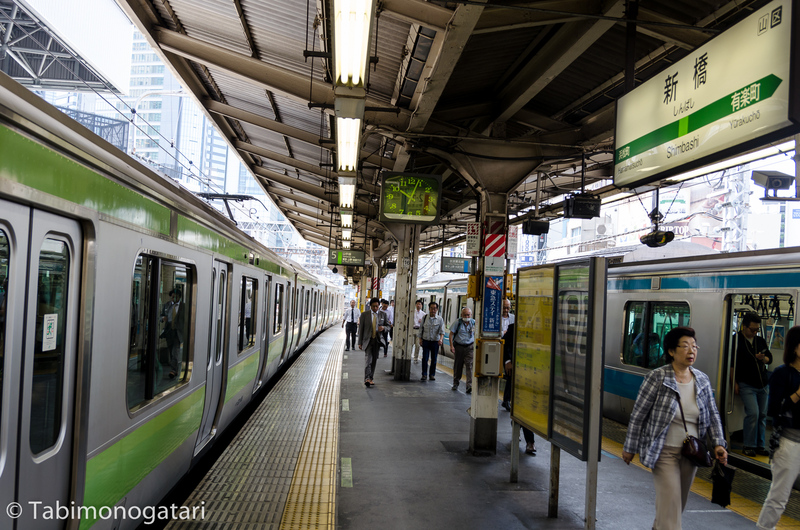 Again with the Yamanote line, Ikebukuro can be reached in fifteen minutes. The second-most frequented station of the world is not the only thing this district has to offer. Make sure not to get lost again and make sure you know which exit is the right one. Head for the Seibo exit to enter the huge shopping mall connected to the station. 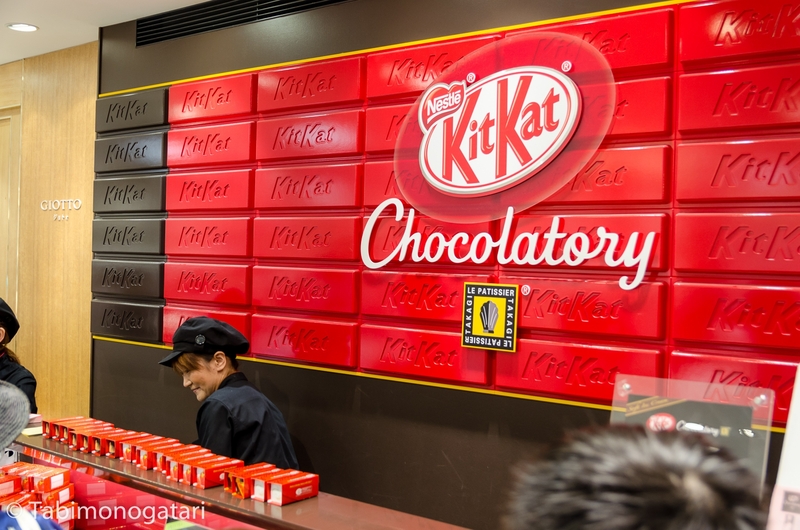 In the first basement you will find the first Kit Kat store, selling all kind of special flavours which change every other week. Besides my favourite flavour Green Tea I also bought Cream Cheese, Strawberry Maple and Chili. 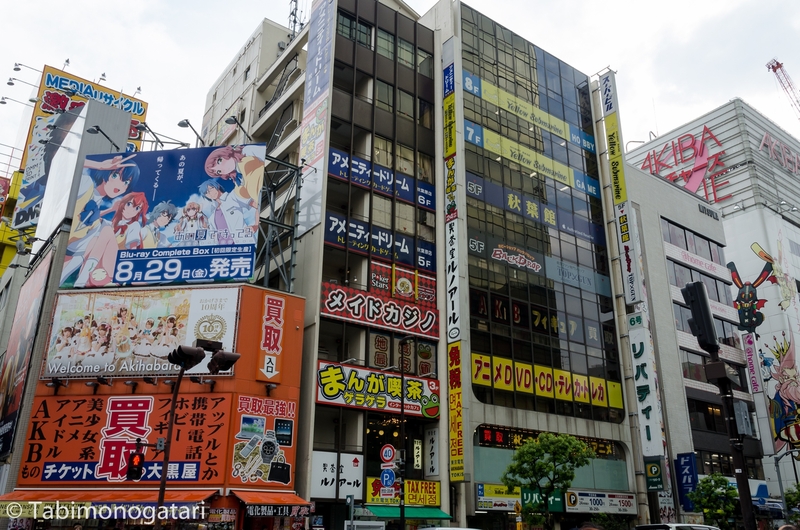 The more interesting part of Ikebukuro is in the East of the station. Just cross the big street and walk through the pedestrian area. 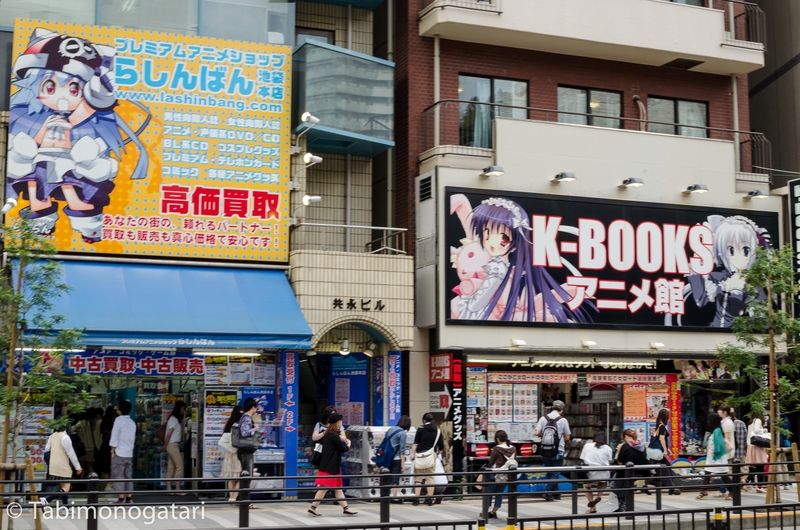 While Akihabara is the paradise for mostly male Otaku, Otome Road is its female-centered counterpart. You will find it very close to Sunshine City, a skyscraper with observatory and a shopping mall. 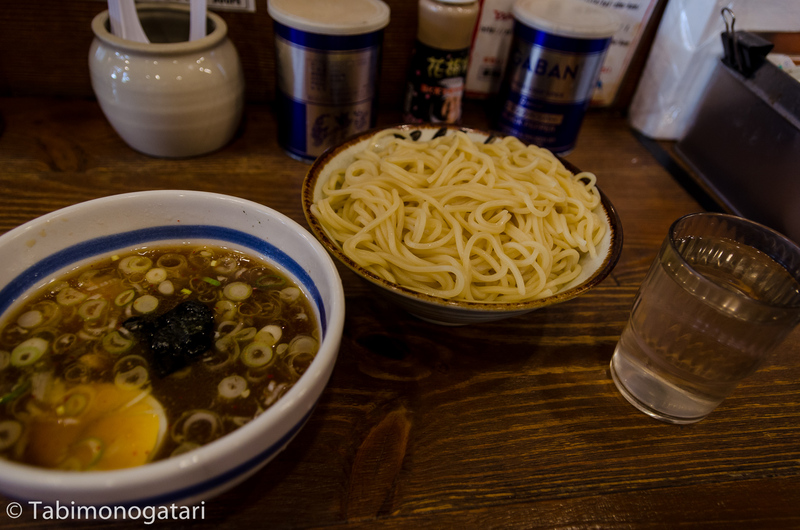 When I heard about the documentary movie God of Ramen featuring the Ramen restaurant Taishoken in Ikebukuro I became interested in their very unique creation of Tsukemen Ramen or dipping style Ramen. 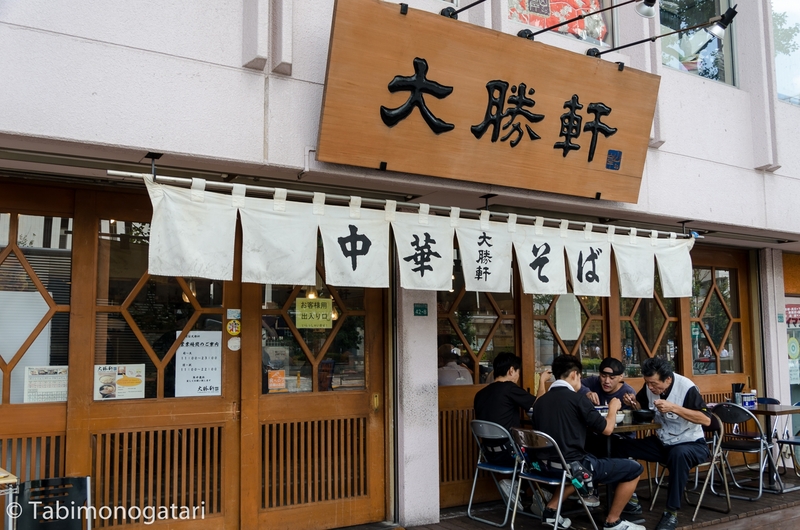 While their original owner retired a while ago, the noodles are still prepared in a quick and tasty way. Try it out if you became fed up with the usual way of preparation. 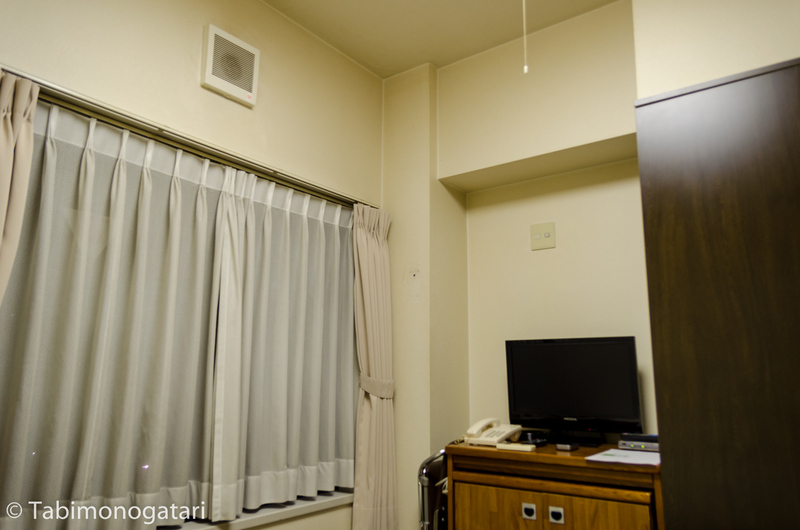 Last time I stayed at the Sakura Hotel in the West of the station. 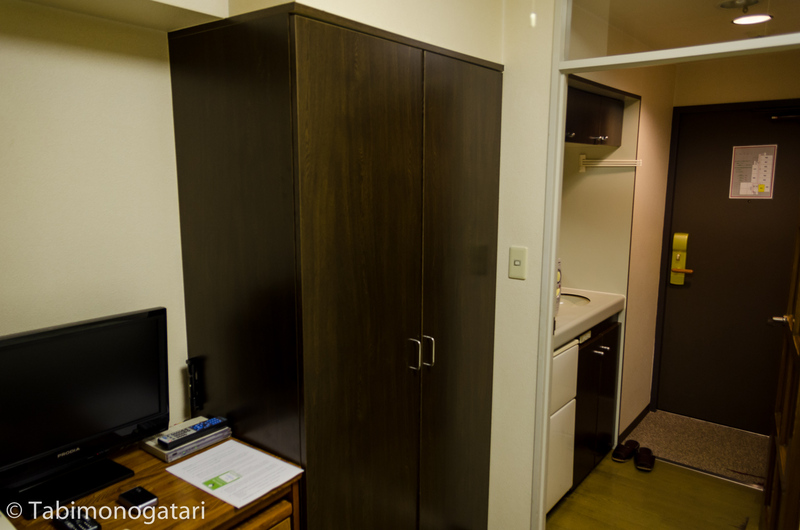 It was a nice accommodation (though I missed a closet), I recommend it to everyone who wants to get to know international people enjoying Japan. In the cafe in the ground floor I met some people to whom I still hold contact partially. 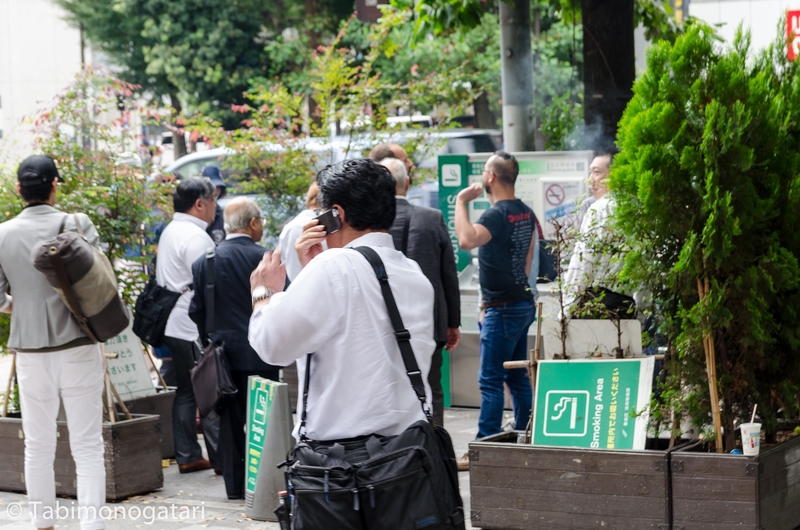 Another thing I noticed is the strict smoking policy in the whole city. Only in designated areas it is allowed to light a cigarette. Even visiting the Undergound is pretty fun. When you pass through one of the passageways on a quite day you might hear birds (prerecorded) twittering. Also keep the few etiquettes in mind while riding trains and subways. 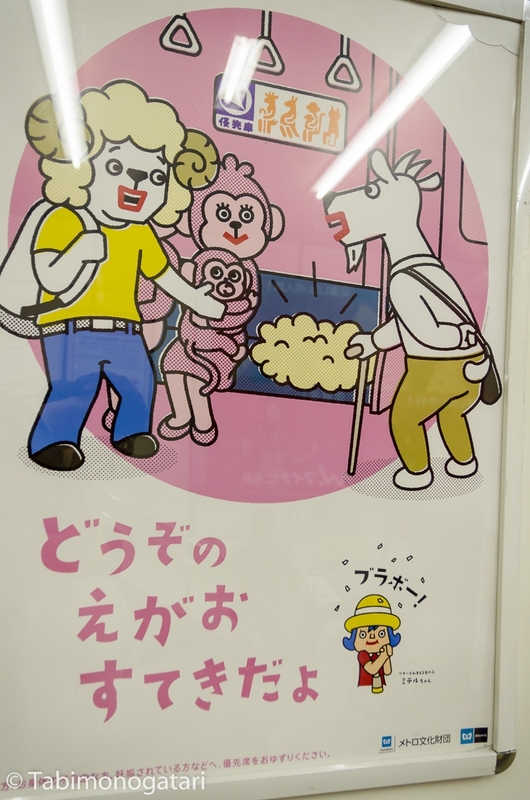 Always stay on the left side while riding escalators and walk on the right (except in Osaka), keep your phone on silent mode (manner mode in Japanese) and offer your seat to customers who need it more. To remind everyone of it, posters are hanging in every station and in the trains. 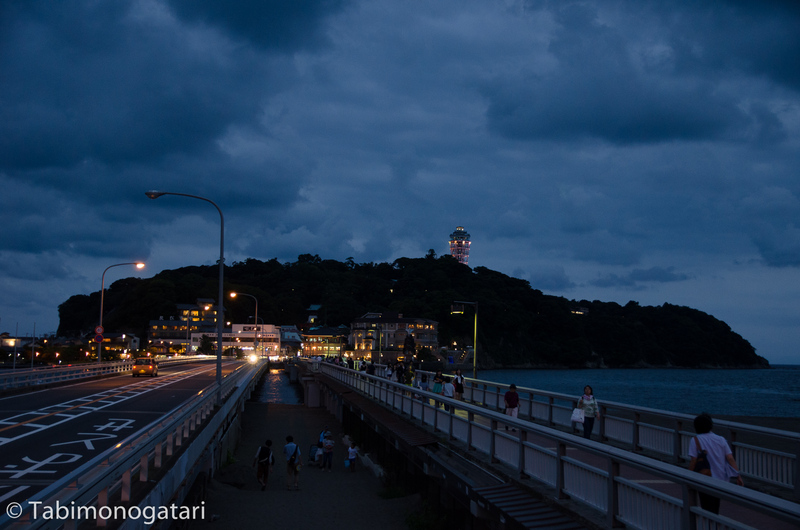 In the evening I took the train to Enoshima, about one hour away from Tokyo. 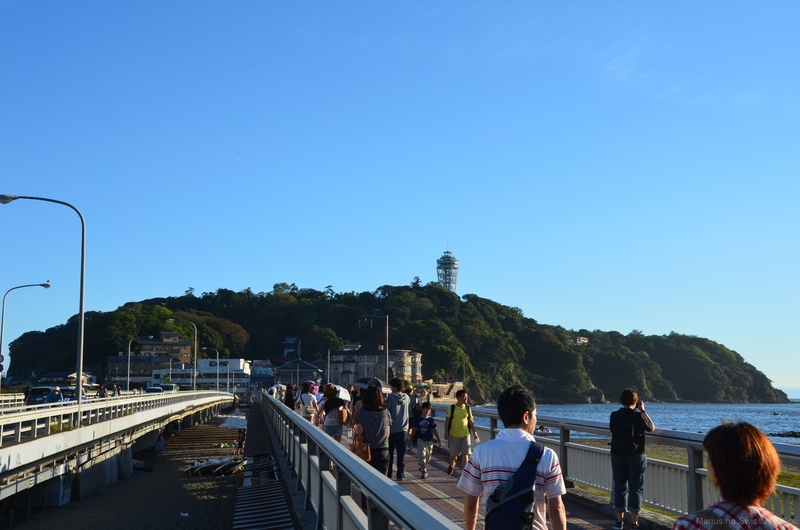 The island close to Kamakura is one of my favourite places in the whole country. With that opinion I am not alone for that many anime are set in this region; to name a few, Ping Pong, Hanayama, Elfen Lied, Tari Tari and many more. 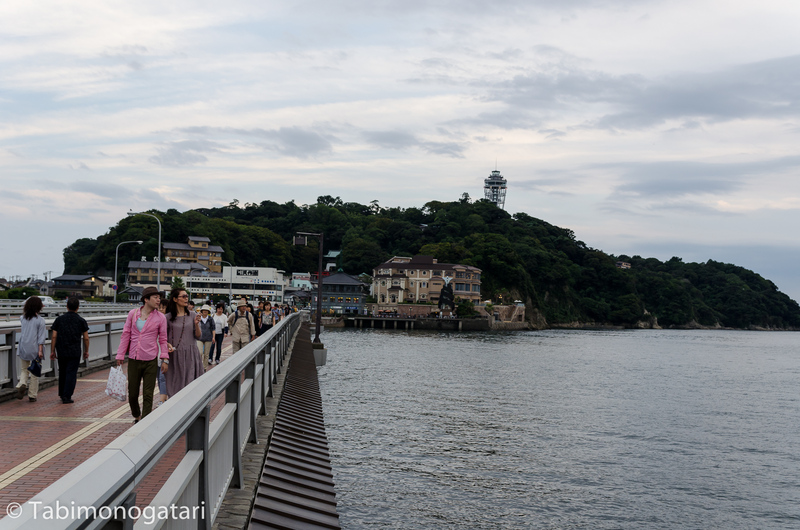 Either transferring at Fujisawa or Kamakura, take the Enoden streetcar to Enoshima station. From the station it is only a few minutes by walk. I love the view when you cross the long bridge to the island. 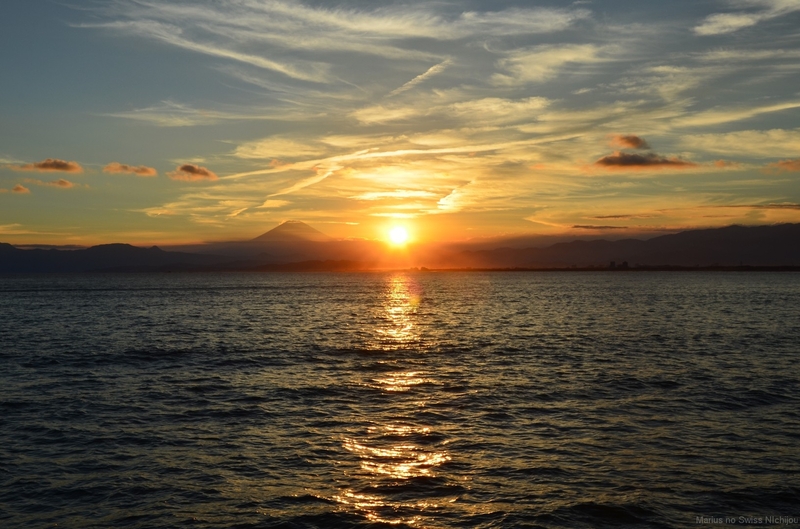 The weather did not turn out to be good unfortunately, so please enjoy the pictures from last time instead, when the sun was setting over the island, illuminating the Fuji-san and the sea. After crossing the bridge make your way up to the top of the island. For the lazy people there is a paid escalator. Visit the local shrine before heading for the Samuel Cocking garden further up. In that garden you will find the Sea Candle, a 60 metres high observation tower. 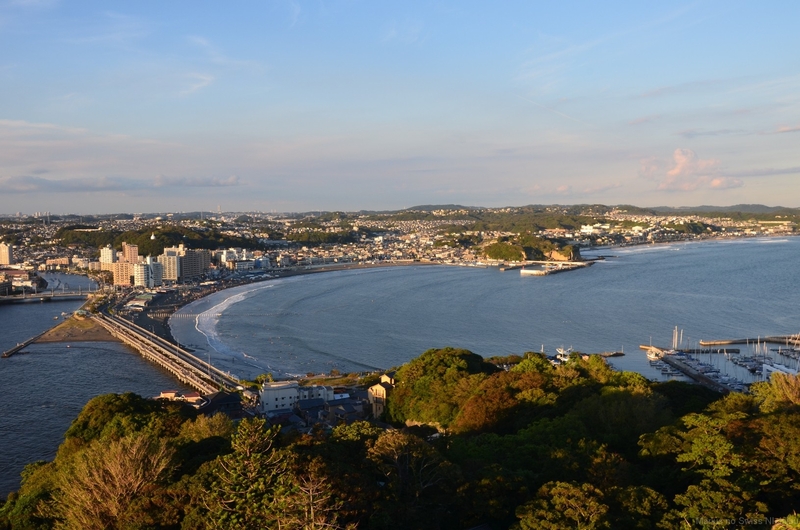 You can see the whole coastline until Kamakura (photo from last time). When it got dark I went back to the station. 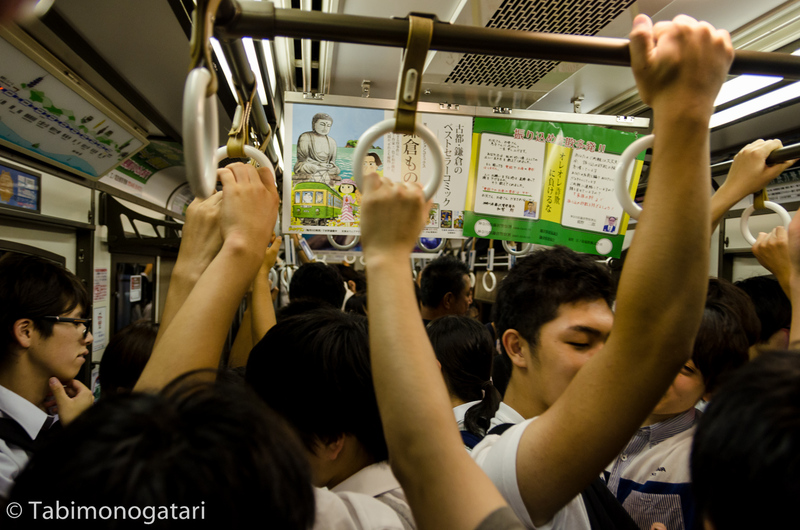 The streetcar was quite full already, but since the Japanese are used to be like sardines in a can while commuting I still found my way in somehow. Back at Shinjuku I explored the Eastern part from the station, housing countless restaurants, izakayas and karaoke places. As expected for a Friday evening everyone was on the move for having some fun. 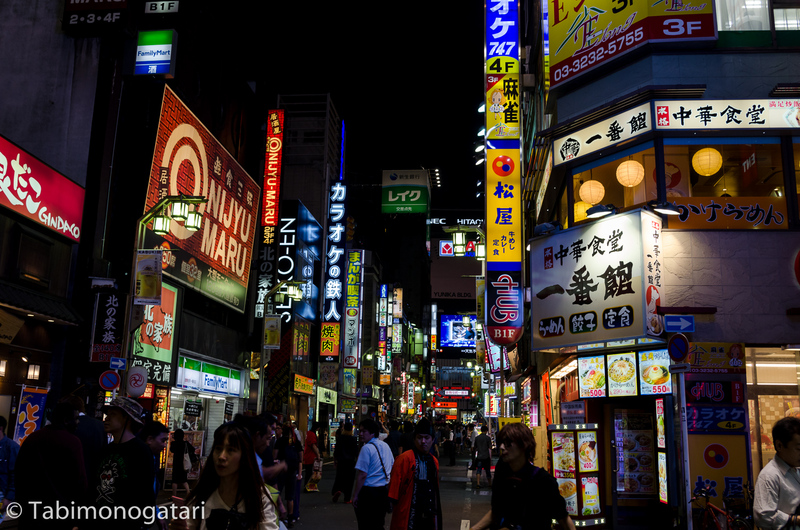 It is also kind of fun to walk through Kabukicho, the red-light district. The place truly lives up to its name, do not become nauseous because of the many blinking and sparkling signs. Also be prepared to be addressed by men in black suits recommending “special services” at an establishment. 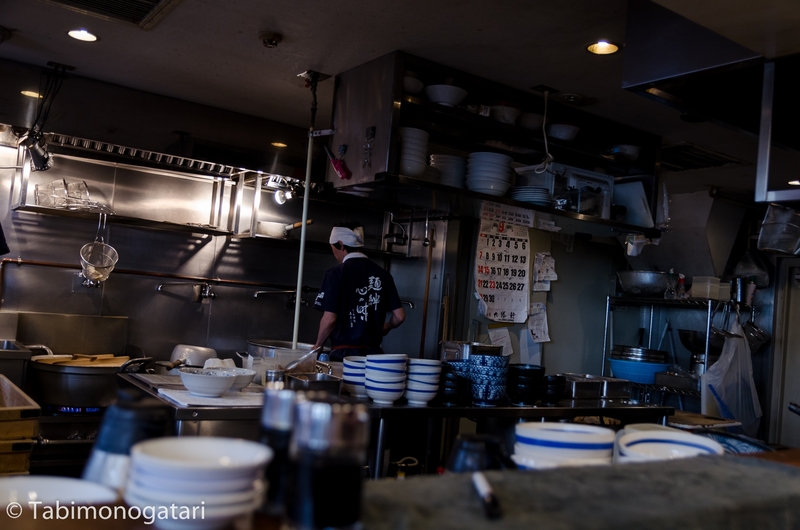 If you are adventurous, find a place in an Izakaya next to drunken salarymen. Typical things to order are yakitori and beer. 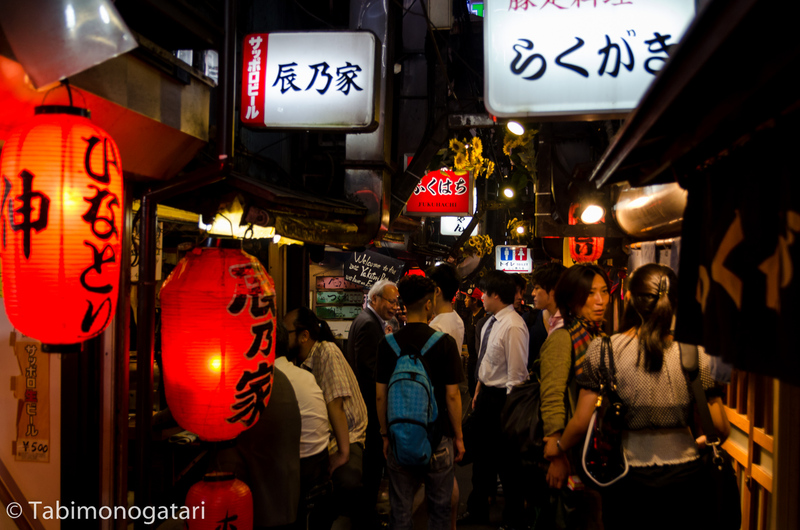 Especially well-known is a small alley close to the railway tracks, called Omoide Yokocho. Without a company it is not so enjoyable, so I decided to go eat Katsudon at a cheap place. 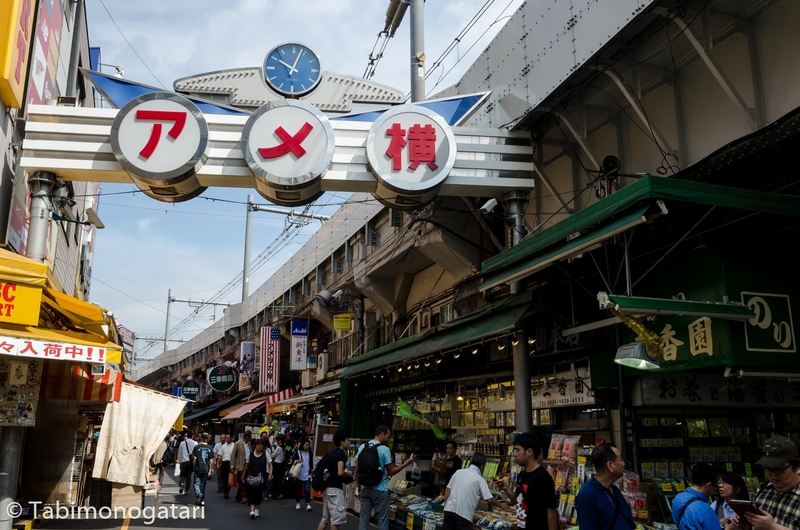 On my last day, I headed to the Ameyoko shopping street very close to Ueno station. The weather improved again and that day it was mostly sunny the whole day. The market street invites to a stroll, maybe you will find something to pick up. 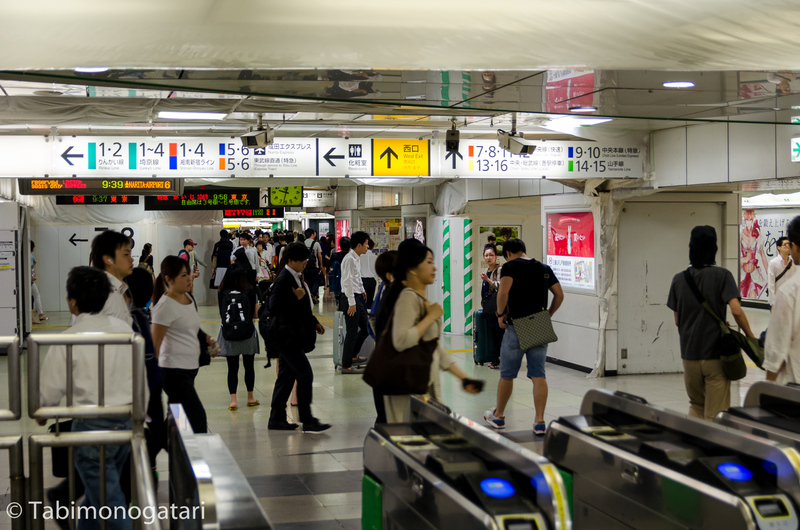 Either enter from Ueno or Okachimachi station, both on the Yamanote line. Transferring to the subway I took a short ride to Tawaramachi station, the closest to a very different shopping street, called Kappabashi. 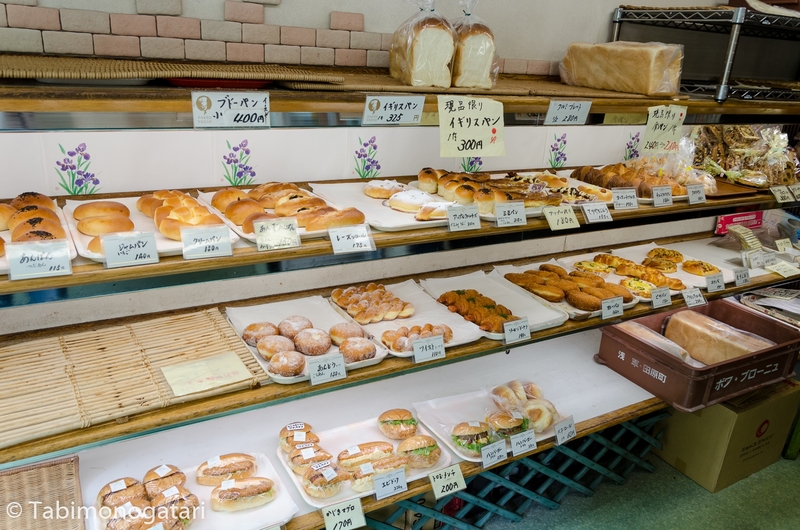 On the way I found a little bakery, where I picked up a fusion of donut and anko pan. Very tasty. 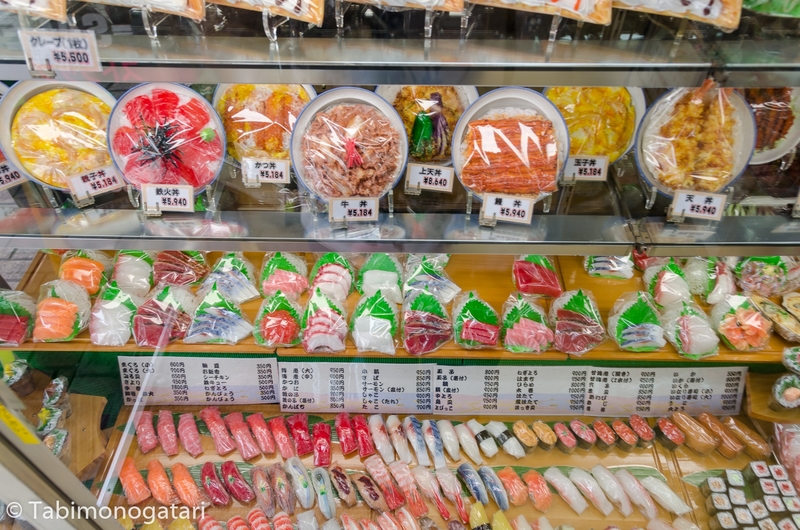 In Kappabashi you can buy everything you need to open a restaurant – except the food. 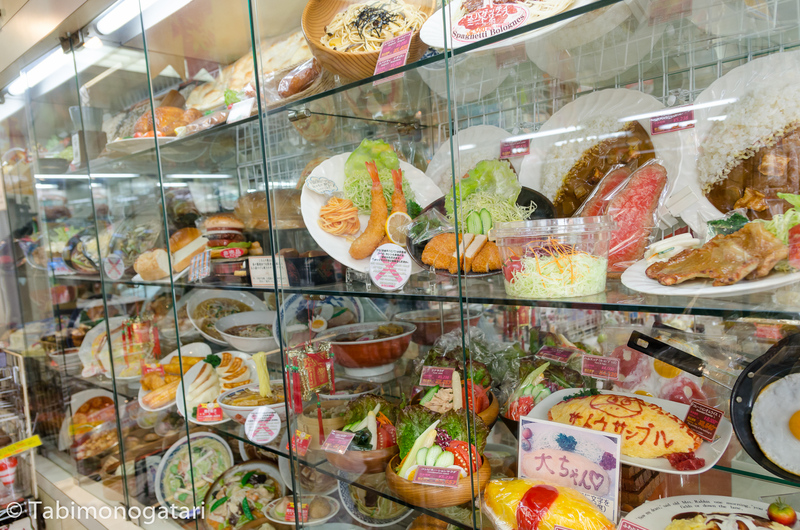 In various shops you will find pottery, big appliances – and food imitates. The fake is of far greater value. In its deliberate attempt to be real, it’s more real than the real thing. Back at Ueno station I passed the Pandabashi bridge across the tracks to visit the Ueno Park. The park is directly next to the station, you can not miss it. 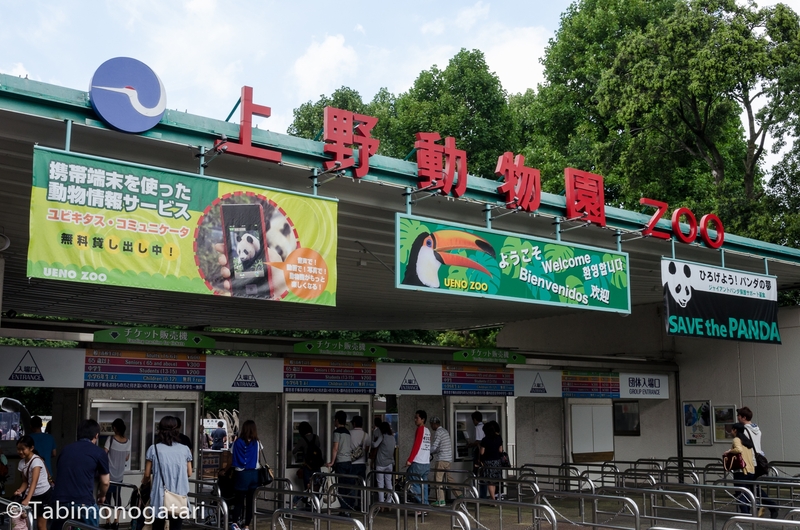 Besides the greenery there are a few lakes where you can rent paddleboats and also a zoo, one of two (the other one is Kobe) which have pandas. Also there are many art and science museums on the Northern side. Make sure to visit one if you have time. In Ueno I met up with another Japanese guy I got to know over the net and we hung out the rest of the day. 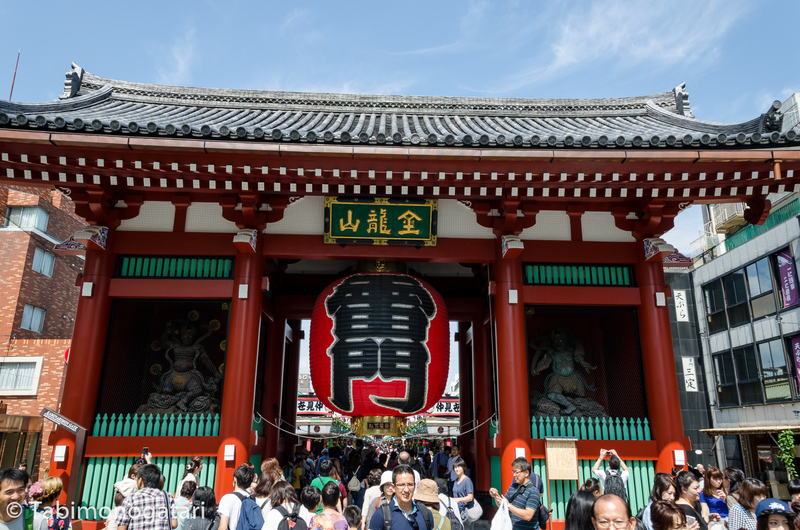 Also very close to Ueno is Asakusa, famous for the most-popular temple in the whole city. 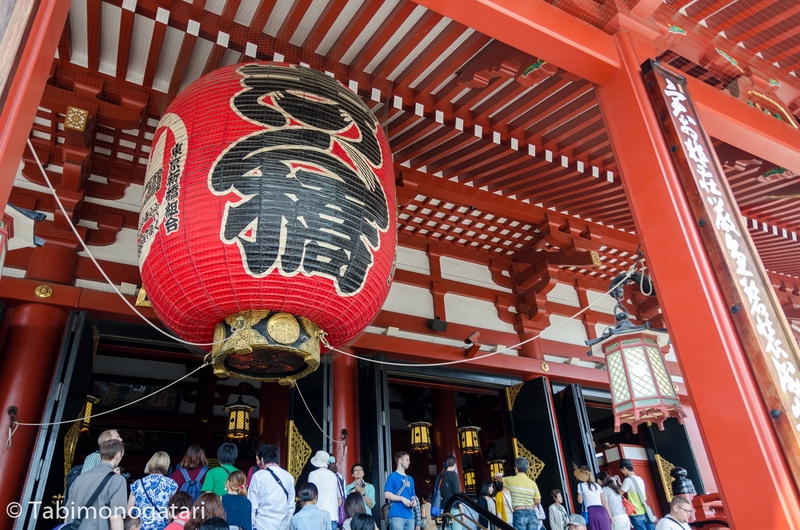 When you enter the area you pass the Kaminarimon, or thunder gate with its giant paper lantern. 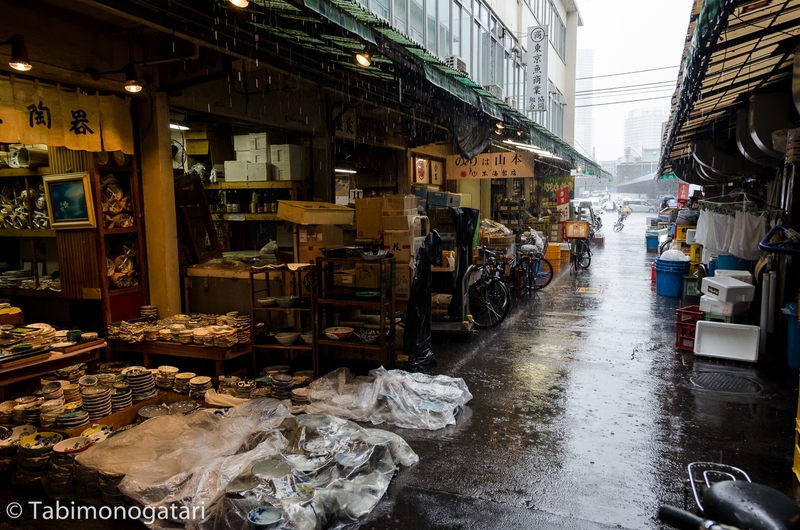 The alley to the temple is lined with various stores and stalls. 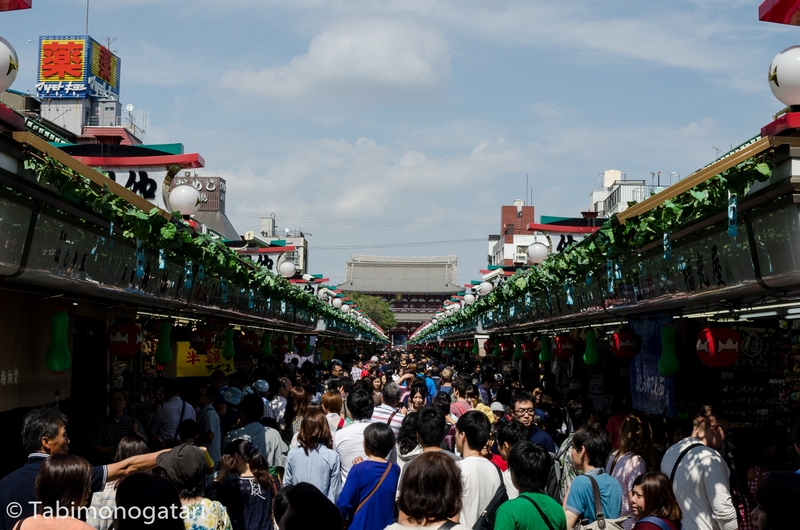 It is especially crowded on the weekends as you can see. In front of the temple was an incense burner. It is believed that fanning the smoke to you brings good fortune. 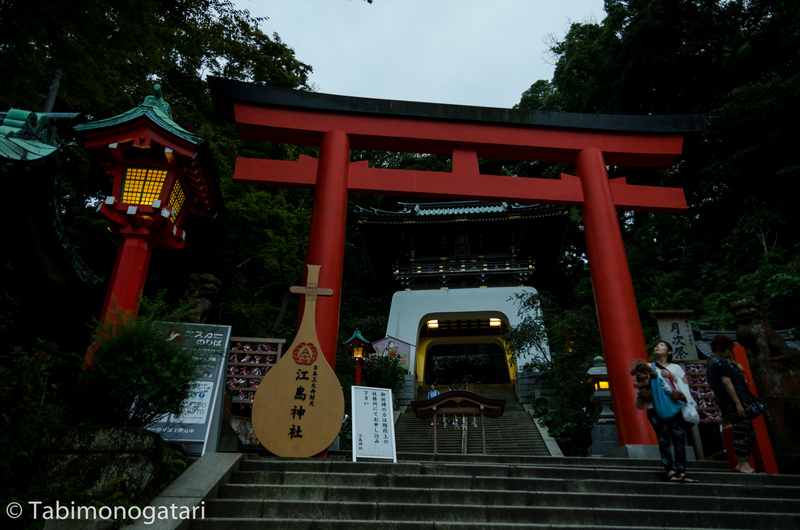 Following the custom, we both tossed a five yen coin into the offertory box and made a prayer to the gods. Unlike at shrines you do not clap twice before making a prayer. Afterwards, we drew an omikuji, or fortune after paying 100 Yen. You draw a stick out of a box and open the corresponding drawer to find a sheet with your fortune. First I did not want to try being afraid of a bad fortune, and I was right. Bad fortune would occur and everything would not work out the way I wanted. Fukou da! There are certainly not enough food pictures in this post yet. For lunch we went to a place specialised in Tempura, original a Portuguese dish, consisting of fried prawns and vegetables. We went for the daily lunch menu which was Tendon. It was the best Tempura I had ever eaten. 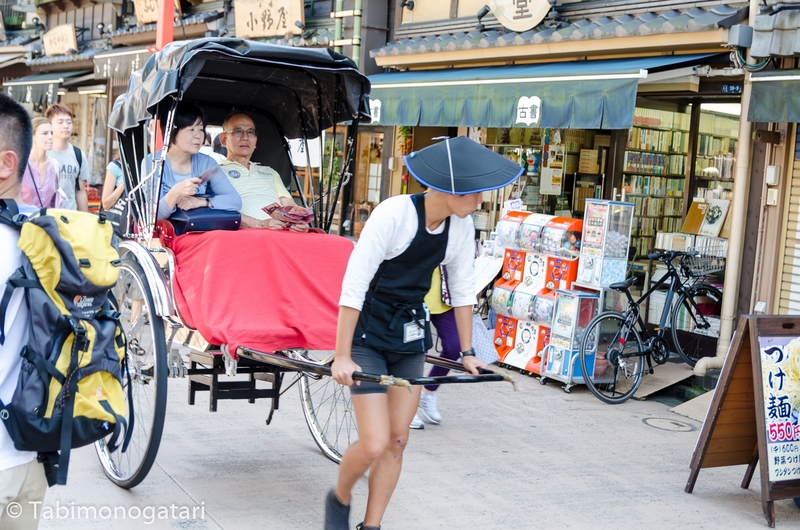 Rickshaws are also a popular thing in this area, it certainly looks fun. 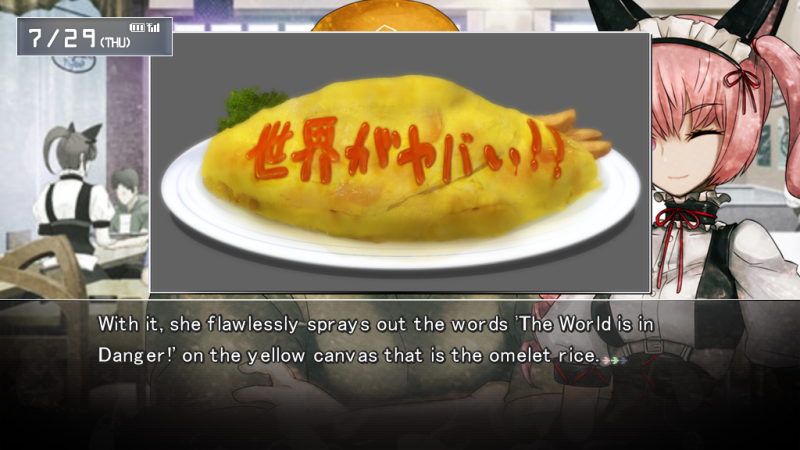 The most popular dish is Omuraisu, with a personal inscription of Ketchup on top of it. I went for a parfait and declined any other offer this time. There are a lot more things you can do, like making a Polaroid photo with a maid as an Omiyage for at home or play games. After shopping a little more we left for Nakano, in the West of Tokyo. 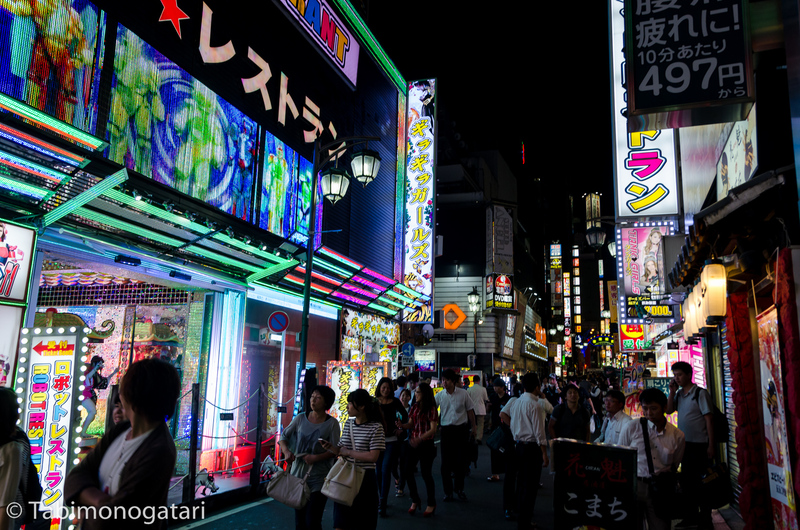 In the Nakano Broadway arcade are many shops specialized on Otaku goods, but there is much more to discover besides. When we arrived, we saw something very unusual. 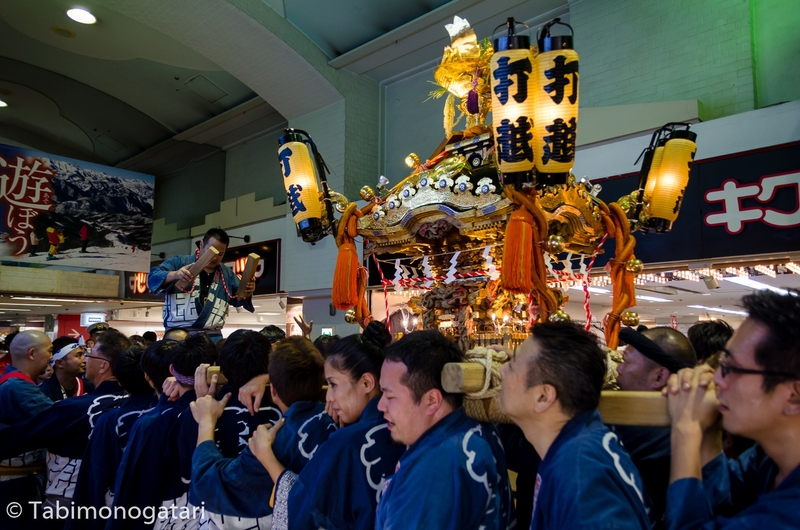 At that time a Mikoshi festival took place. 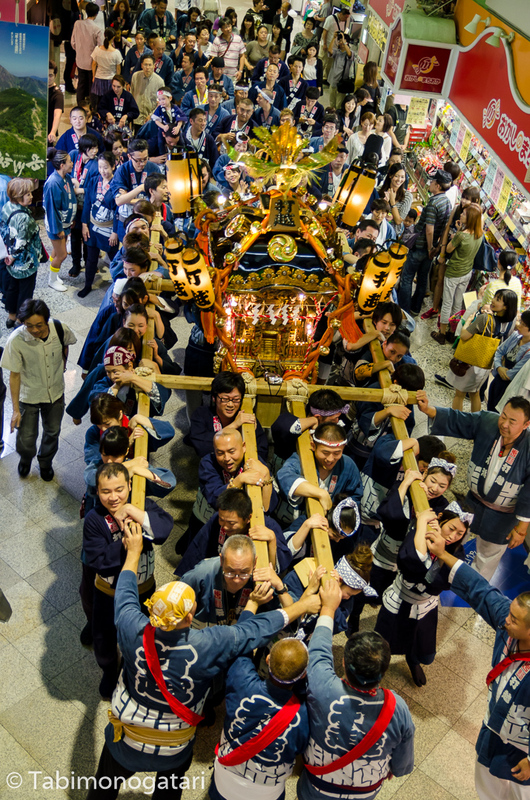 The portable Shinto shrine was carried through the arcade and everyone was excited. After that spectacle we went to a Karaoke place before having dinner. 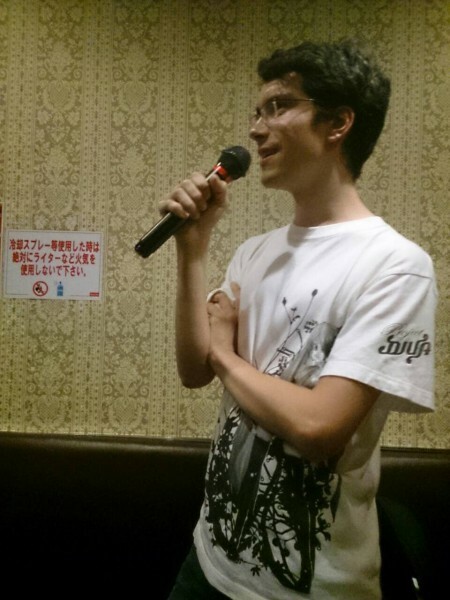 Japanese Karaoke is very different from its Western counterpart. Instead of embarrassing yourself in front of a large crowd of strangers you will do so in front of your friends. After checking in you rent a room with all equipment you need. The songs can be selected using a console. It is unbelievable how many songs are available every time, from old to brand new, both Japanese and Western. It can be hard to get along with the Japanese panel so ask a friend who is more fluent. Also keep in mind that the lyrics are displayed as Hiragana with transcribed Kanji. If you can read and comprehend it very fast just sing along, otherwise prepare the lyrics of your favourite songs ahead or choose a English song. Apparently I deeply impressed my comrade with my cover of Bauklötze, a German song from the recent anime Shingeki no Kyojin. After having a lot of fun there we went out for dinner. 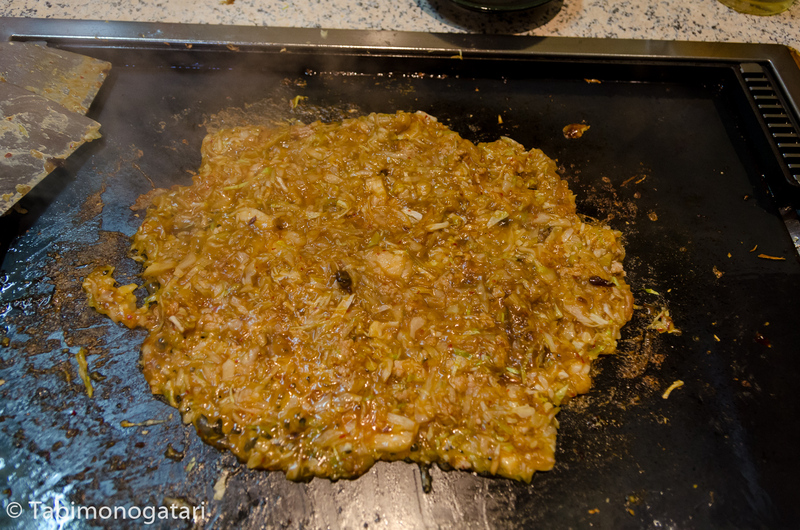 Since my new colleague lived in the area he could recommend an excellent Monjayaki place. 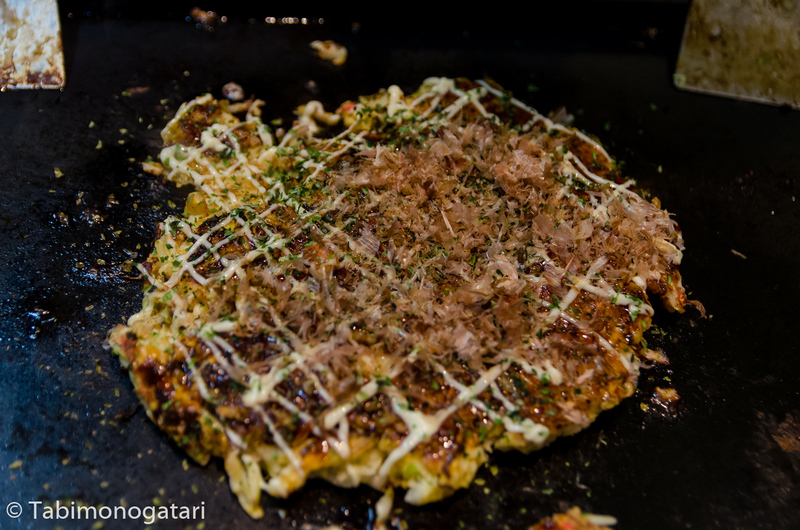 I mentioned Okonomiyaki (middle) before when I was in Osaka. 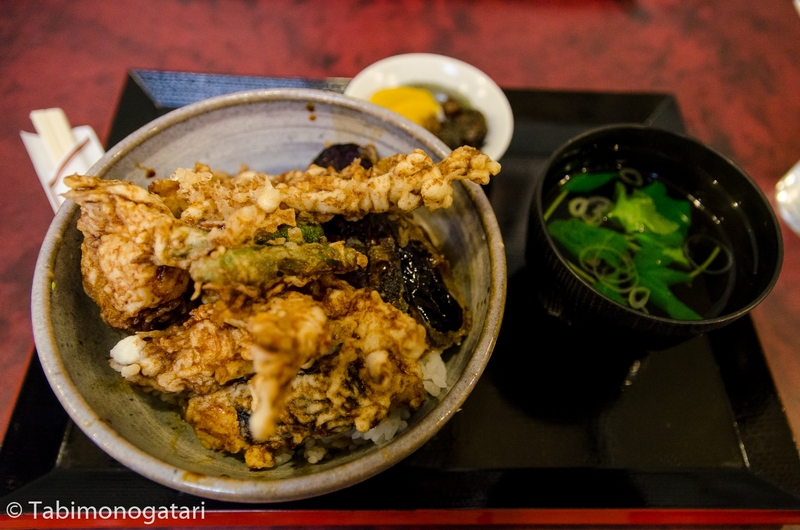 Tokyo has its own variant of the dish, called Monjayaki (left). The dough is more fluid and is eaten with small spatulas. 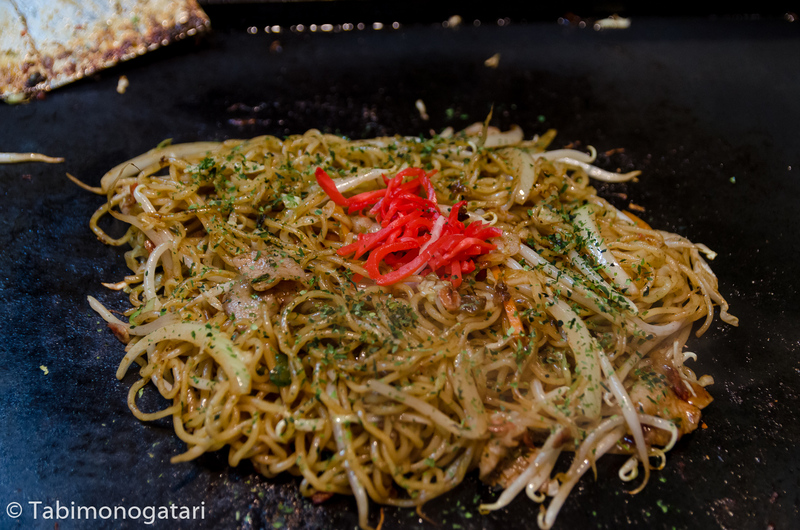 Even after the two portions we were not satisfied, so we went with Yakisoba at last. After the eventful day I returned home and started to pack my things. I was glad buying a new suitcase to fit all my new belongings and souvenirs. As you can imagine, there are much more places I visited that I could not go into detail. For more details have a look at the map I made which includes all places I visited. 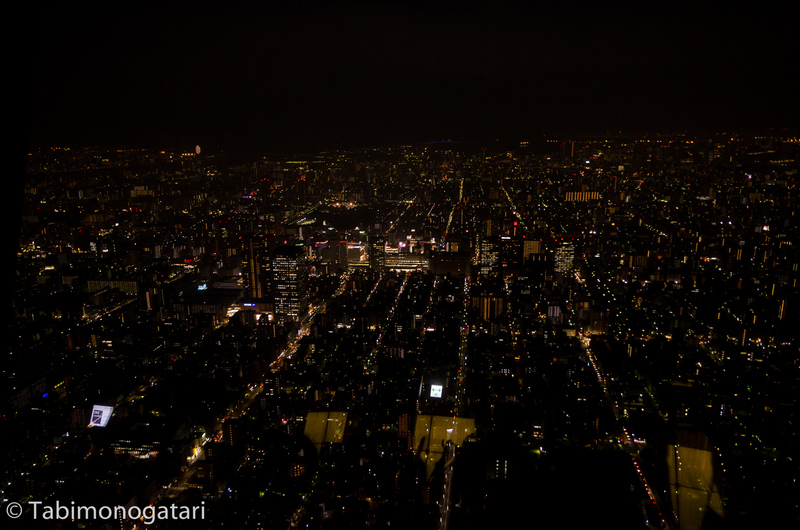 To example, also try to visit the Tokyo Tower and the Yoyogi Park. If you have another day at disposal, do a day trip to Kamakura or Kawagoe, both less than an hour outside of the city.